Why choose SWISS WATER® Process? The decaf coffee segment is a significant part of the coffee market, representing approximately 15% of total volume. Importantly, the decaf consumer is different than the regular coffee consumer. Our research studies indicate that this coffee consumer loves the taste of coffee but chooses to switch to decaffeinated coffee in order to reduce, minimize or eliminate the negative health impacts of caffeine. Fair Trade certification is a market-based model of international trade that benefits over one million farmers and farm workers in 58 developing countries across Africa, Asia and Latin America. Fair Trade certification enables consumers to vote for a better world with their dollars, simply by looking for the Fair Trade Certified label on the products they buy. Does Your Coffee Cup Affect the Taste? When you sit down with you favorite coffee mug/cup, is it standing in the way of the best tasting coffee? Most of us don't think about what we're drinking out of, but rather just the coffee itself. To assist with making the most of your coffee drinking experiences, here are some tips to make sure each cup tastes as good as it should. 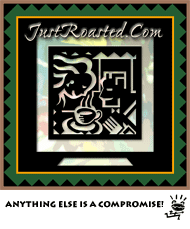 JustRoasted.com sells coffee beans shipped within 24 hours of roasting. Most small batch roasters believe that fresher is better, and coffee is at its best when made from beans roasted no more than two weeks ago. Ground coffee begins to stale after 30 minutes. For whole beans that are exposed to air, for example sitting in the hopper of your grinder, you will notice a drop off in the fabulous crema after 10 days. Sure, it will still be miles ahead of 99% of the coffee on the market, but none the less expect to notice the decline around the 10 day mark.